Whether you’ve been you been a distributor for a short time or for many years, continuing education about the products you sell is important. 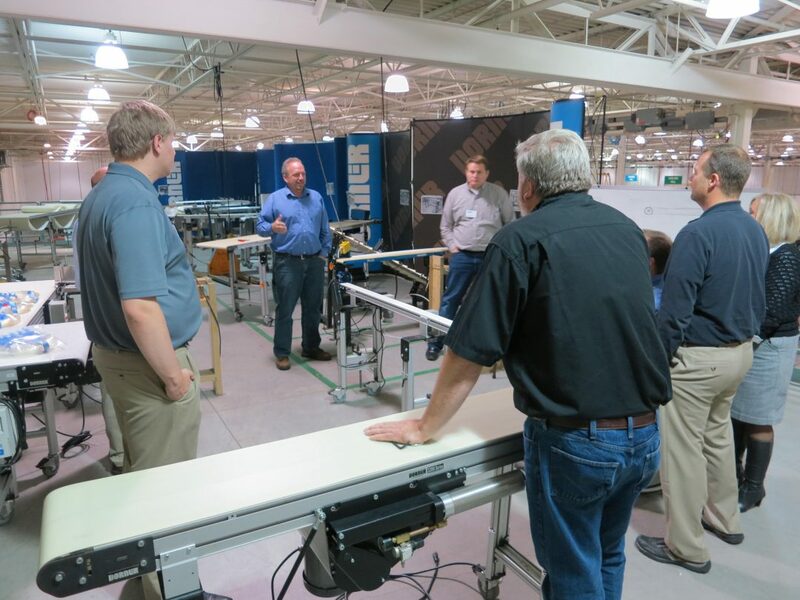 Dorner’s Advanced Distributor Training is a multi-day course held at our headquarters meant to give distributors a more in-depth look at applications, new products, industry competition, Dorner sales processes and basic service items. Before taking Dorner’s Advanced Training distributors are required to take the Basic Training which gives distributors a broad overview of Dorner’s products and the services they offer. The main focus of the Advanced Training is to help distributors get a better understanding of our products and different sales techniques they can use. During the multi-day course, different members of Dorner’s team speak to distributors about a variety of different topics. These include motors and controllers, standard specials, and useful sales techniques. During the motors and controllers session, distributors will learn about Servo motors and controls. These motors are used in applications where precision is important or objects must be moved to the same location every time. These applications are generally more specialized and not called for very often so distributors might not be as familiar with them as they are with other more common drives and controls. Learning more about Servos will help distributors recognize what applications they would be good for and give them more information they can use when talking to clients about differences in the types of conveyors. Standard specials are modifications on conveyors that Dorner receives frequently. These usually are backlit conveyors for checking products, vacuum conveyors for holding products down on the conveyor, liftgate conveyors to create safe and fast walk thru access, and common drive conveyors to maximize energy efficiency and space. Learning about these standard specials and Dorner’s engineering capabilities is great for distributors because it lets them see how Dorner can engineer to meet a client’s specific application needs. With this knowledge, distributors will be able to recognize applications where a standard product wouldn’t meet a customer’s needs but knows what Dorner’s capabilities are and could recommend a standard special or engineered to order conveyor. Being knowledgeable about Dorner products is great but if distributors don’t have strong sales abilities they’ll have trouble selling products. That’s why a large portion of the Advanced Distributor Training is dedicated to teaching distributors sales techniques they can use to make successful sales. One of the main things Dorner encourages when selling their products is value selling. Let the product sell itself. Dorner show distributors different things they can talk about such as how implementing a Dorner conveyor can increase productivity or how automating certain parts of production can lead to an increase in revenue for the company. Value selling is all about matching what Dorner does with each customer’s unique needs. We have proven our value when the customer wants to do business with us and is happy with our products. To do this, salespeople need to discuss value drivers then present a solution using a good sales pitch. Continuing education in any job is important but especially important for salespeople. Dorner’s Advanced Distributor Training helps distributors become more knowledgeable about Dorner products and how to apply value selling techniques in the sales efforts. The whole goal of this training is to help distributors and make sure that they have all the information they need to be successful.